baby hedgehogs on Long Island. MANY OF YOUR QUESTIONS WILL BE ANSWERED THERE. We are small hobby breeders of top-quality African Pygmy Hedgehogs located on Long Island, New York. Our babies are home-bred and hand-tamed, and their parents are our own spoiled personal pets. Please read the full site, then contact to get on the waiting list. 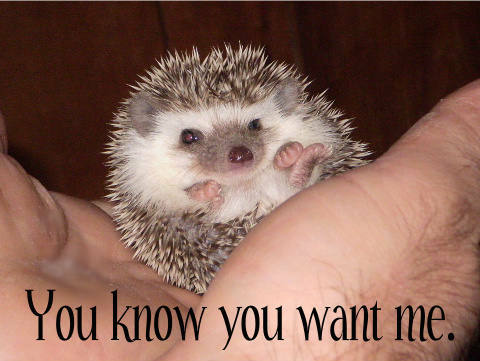 Don't miss your chance to bring home one of our prickly darlings! Here at Hedgie Mama, we understand that times are tough. Lots of pet stores are charging $300 and up for unsocialized, possibly unhealthy hedgehogs. We seriously doubt that we'll ever charge that much for one of our babies! We're keeping our prices low, so the joy of hedgehog ownership is always within reach, no matter what your budget.